I suppose the easiest place to start is with the obvious. A NMCMS-record crowd– something we’ve seen a lot of lately– watched Pitt pound Navy into the ground, 42-21. The Big East-leading Panthers rushed for 244 yards, including 156 yards and 3 TDs from LeSean McCoy. Jarod Bryant led Navy with 81 yards and a touchdown, while Shun White had a 40-yard TD run of his own. The loss ended Navy’s 3-game win streak and dropped the Mids’ record to 4-3. It’s hard to point out anything the Mids did well. The offense sputtered, the defense played like matadors to LeSean McCoy’s bull, and the kickoff coverage gave Pitt good field position to work with. It was a long afternoon. The game was a tall, frosty mug of reality for the defense. Don’t get me wrong; they are better than last year. But after three straight wins, it seems that collective opinion may have exaggerated the extent of their improvement. The Wake Forest game was undoubtedly a dominating performance, but there were deficiencies in the Rutgers and Air Force games that maybe we glossed over a bit. Rutgers really had no trouble at all running the ball on the Mids. Their problem was that they still hadn’t found their identity as an offense and weren’t dedicated to running the ball. The Scarlet Knights averaged 6.2 yards per carry, but still turned to an inconsistent passing game in key situations. Pittsburgh had no such identity crisis. First down? They ran. Third down? They ran. Two minute drill? They ran. And Navy couldn’t stop it. LeSean McCoy was excellent, but it wasn’t just him. Fullback Conredge Collins ran for 50 yards on only 9 carries, while LaRod Stephens-Howling averaged 4.2 yards per carry and punched in two touchdowns. McCoy may be the lasting image of the result of Navy’s futility, and he certainly caused a spike in this week’s missed tackle count; but it didn’t really matter who Pitt gave the ball to. This game was won for them at the line of scrimmage. And that’s true on both sides of the ball. The biggest shame in all of this– other than losing the game– is that Jarod Bryant actually had a decent game relative to his past performances, but I doubt too many people will recognize it. Coach Niumat said that he couldn’t afford to shrink the playbook against Pitt, and he didn’t. Jarod responded, running the triple option capably and getting the ball to the right people. Unfortunately, when the blocking breaks down it doesn’t really matter who you give the ball to. Some of you may remember back to the week after the Duke game when Bill Wagner posted on his blog about an observation I made about the Blue Devils’ defense. When you run the triple against the defensive alignment that Duke used, the playside tackle’s responsibility is to pass inside the defensive end and block the middle linebacker. But instead of using the defensive end to pursue the ball, Duke’s coaches used him to actually “block” the playside tackle and keep him from getting to the second level of the defense. This did two things; one, it freed up the middle linebacker to flow to the ball. Two, by turning inside, the DE gave the quarterback a “keep” read. Jarod would keep the ball, then get swallowed by the unblocked LB. You can see how Scott McKillop is lined up a little deeper than usual. That, combined with interference from the DE, kept Navy’s tackles from getting to him. He was able to move to the ball all afternoon and led the team in tackles. Now, it isn’t as if there is no answer to this. There are a few things the offense can do to take advantage. One is the counter option, which we know can be set up nicely by defensive ends that cheat inside on the snap. 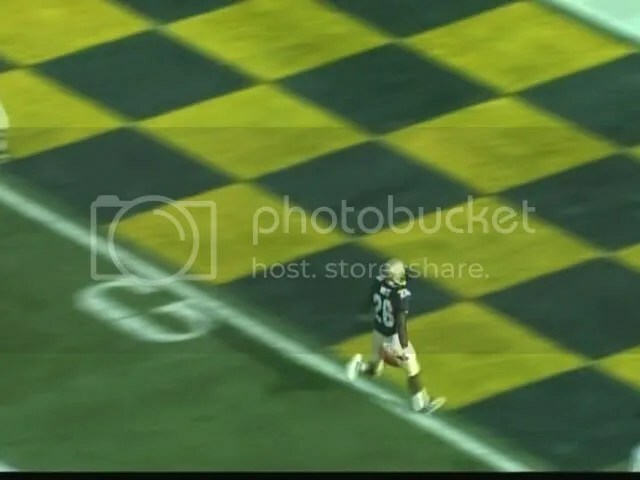 The counter option was Navy’s most successful play for the most part, and was the play that they used to score their second touchdown. But unlike some others in this offense, it isn’t one of those “run it ’til the defense stops it” kind of plays. Since the quarterback starts the play with his back to his read, there’s a chance that he’ll get crushed if the pitch key blitzes. That’s what happened to Kaipo in last year’s Wake Forest game. If the defense is expecting the counter option, they’re more likely to blitz. That’s particularly bad when you’re already on quarterback number two. The midline option can also be effective when the middle linebacker is quick to move outside, but when Coach Jasper tried to run it, the line just couldn’t create enough space in which to run. The coaches had answers. Unfortunately, the Mids just couldn’t execute them. When you’re watching these plays in real time, you might get the impression that Jarod missed reads. Only after going back and watching the game a couple times do you get a feel for what really happened. Kaipo wouldn’t have fixed this, and neither would putting in Ricky Dobbs. I’m sure that the team will block better in weeks to come, and depending on who plays in the Eaglebank Bowl, we probably won’t see a defense as good as Pitt’s for the rest of the year. Strangely, after seeing this game I actually feel a little better about the offense if Jarod has to play. Hopefully this game doesn’t shoot his confidence. There’s no doubt that this game was a stinker, and the coaches should lose their voices yelling in practice today. But it’s important to keep a little perspective. Navy is 4-3 after playing 4 BCS teams, a top-25 MAC team, and Air Force. The team has come out of that stretch in position to win the CIC Trophy and become bowl eligible. They’re still on track to meet the standards set over the last five years. — I have now heard more than once about “grumbling” from TV analysts calling the game. As in, “after Navy’s 1-2 start, there was some grumbling about whether Ken Niumatalolo was the right man for the job.” Can these guys shut up about this already? Who, exactly, was “grumbling?” A few select message board jackasses? Because I don’t think anyone else was. I certainly hope that there is a slightly higher standard for what’s worthy of on-air discussion than the ramblings of message board idiots who are ready to jump off a cliff after three games. I can only imagine what other nuggets of wisdom might come to light if they talk about what they read on message boards. The ball is out of his hand. Whether it broke the plane of the goal line before he dropped it is extremely questionable. I don’t know if that’s what the cool kids are doing nowadays, but he needs to cut it out. God help him if the team loses to Notre Dame because of something like this. Get on him, Coach DuPaix! — I noticed a few players wearing a new helmet style this week. I’m not sure if it’s related to all the concussions we’ve seen this year or if it’s just some new equipment that came in. One of the usual adjustments to this type of play by the DE is the tight formation they used for much of the ND game last year. Bring the receiver in to 1 yard outside the A-Back, and send the WR for the ILB and arc the tackle out to the corner. Didn’t see this and was wondering if they would do it. Good stuff. I thought the Revolution helmet (the one Kaipo and others wear, and JB was wearing before) was touted as more concussion-resistant when it first came out. The new helmet style JB was wearing looks goofy, but if it’s more protective that’s a good thing. Another thing that ticks me off about announcers is their insistence on labeling the offense as “grind it out,” kill the clock, 3 yds and a cloud of dust thing. They did it in the GT game too. The offense can be used that way, as can any offense, but it creates way more big plays than any west coast dink ‘n’ dunk. SS does a great job with the game notes putting in the stats on where we rank with scoring drives of 1 or 2 min., he should bold that and highlight it for the announcers. I noticed the helmet thing too. DeSean Jackson of the Eagles actually lost a touchdown earlier this year dropping the ball before he got into the end zone. I would sort of love to be on the sideline if Shun ever dropped it too soon just to see veins pop on Ken’s forehead. Triple fan– I actually traded e-mails with someone about that a couple weeks ago. We seemed to be using that formation a lot this year. I theorized that maybe because our WRs are so huge this year, they could lay a good block on the linebacker. I was also surprised that we didn’t see it more, since it’s been a staple all year. I’m sure there’s a reason. It looks like the videos were taken down by Vimeo. I’ll but them up on Dailymotion tonight, so hold tight if you missed them. Time to lay some wood on SMU and Temple and build up some positive MO for the ND game. I believe the new helmet is the next-gen version of the Riddell Revolution. The Revolution is Riddell’s anti-concussion helmet that is apparently extremely effective. It looks to incorporate some of the features that Schutt’s anti-concussion DNA helmet. Specifically, the different “levels” of surface. It’s good to see Navy pushing the new technology on their athletes. I noticed the new helmets as well. I had just gotten used to the other “new” style (like the type that Peyton Manning wears). I actually like this new-new style, looks comfortable. BTW, that helmet is the Riddell Revolution Speed. All this video footage and all you people want to talk about is football helmets! With Duke and Pitt having used their DE to “block” Navy’s Tackles and thus give the our QB a “false” read, one would now expect a few more of Navy’s opponents to use the same strategy…hopefully future game plans will include a few reverse options to counteract this defensive tactic. False read? Coach never let the QB have an option; he started calling trick plays in the first series; and didn’t give the QB any real option plays until the fourth quarter. I can tell you that Saturday and Sunday Shun’s sponsor dad and Shun’s buddies all told him that he was very lucky. We told him he almost pulled a DeSean. Hopefully he got the message! Very informative and astute post about the game, Mike. I also liked “triple fan’s” observation–very insightful. We all should be grateful to be 4-3 with the softer half of the schedule on the horizon. There is no doubt about it–we were dominated at the line of scrimmage by a bigger and faster opponent. Wannstedt and his staff did a great job of preparing and scheming. It is very difficult to stop a good running team with a 3-4 when your linebackers are undersized and your secondary doesn’t tackle all that well. We also need to be exceptional on special teams when we are outmatched. That’s what sponsors are for! Your analysis (as always) is excellent. And this time your conclusions are right on. Jarod did play well . . . but the Navy blockers all along the line were beaten. Nobody’s better qualified to coach Navy football than Ken Nuimatololo. Nobody. Expect to win. Part of being “qualified’ is being available – PJ’s not.